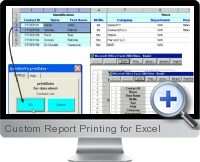 Custom Report Printing for Excel assists to view, extract and print out your worksheet records based on standard or personalized reports within Excel. A ready to use method will enable you to print one or several rows in a standard vertical page, in just one click after installing the add-in. A merge method will enable you to define your own worksheet templates. Custom Report Printing for Excel will cover the majority of your data sheet printing requirements for personal or professional needs. Simple vertical data form (Default format). Merge fields can be inserted in cells, auto shapes and Word Art objects, headers and footers. Print preview or direct printing. Save the resulting worksheets of the merge process.